Spokeswoman says McLaren Medical Center undertook “aggressive testing” of water and the facility is now safe. Flint’s contaminated water likely contributed to the Legionnaires’ disease outbreak in Genesee County, where the bacteria was found in a hospital’s water supply, an expert for McLaren Regional Medical Center said. Water testing during the outbreak found Legionella bacteria at the Flint hospital, where an expert on the disease concluded the organism likely came from the city’s tainted water. 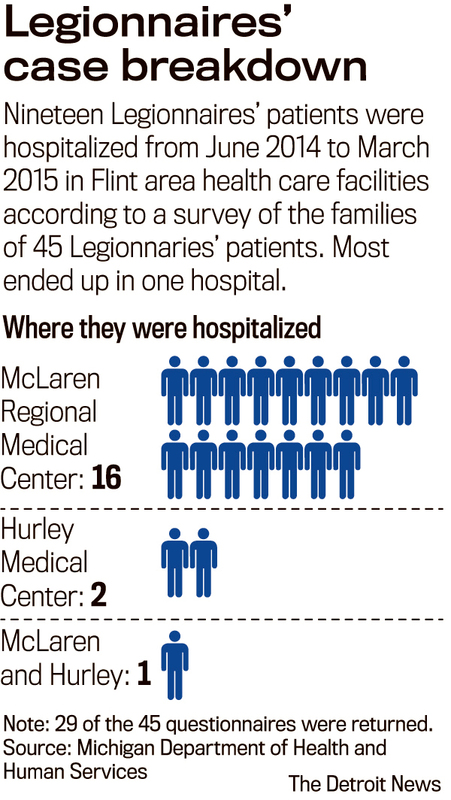 Further, a state analysis showed that a high number of those diagnosed with Legionnaires’ in Flint had been patients at McLaren Flint in the 14 days prior to showing symptoms. Gov. Rick Snyder on Jan. 13 reported a spike in cases of the deadly disease in Genesee County, but he and state health officials said it was unclear if it was tied to Flint’s water crisis. The state reported 87 cases, including nine deaths, in the months after Flint started drawing corrosive water from the Flint River instead of the Detroit Water and Sewerage Department. “The water quality issues, from a microbiological point of view, certainly were a factor in the increase in Legionnaires’ disease in Genesee County,” said Janet Stout, a research associate professor at the University of Pittsburgh’s Swanson School of Engineering and an expert on Legionnaires’ disease. She was hired to help the hospital assess and deal with the Legionella germ found in its water. In an email to The Detroit News, McLaren spokeswoman Laurie Prochazka confirmed the facility undertook “aggressive testing” of its water after noting an increase in Legionnaires’ there and at other hospitals in the spring of 2014. The medical center took action, and “all Legionella testing continues to show the McLaren Flint water supply is well within safety and quality standards,” Prochazka added. Legionnaires’ disease is caused in warmer months by a bacteria in warm fresh water that leads to pneumonia and sometimes death. The bacteria can be found in large plumbing systems, hot tubs, air-conditioning units and fountains. Heightened scrutiny of the potential role of hospitals in recent outbreaks comes as Snyder’s Flint Water Advisory Task Force on Friday predicted another surge in Legionnaires’ disease this spring, since the bacteria flourishes in warmer temperatures. Stout said the germ likely entered the hospital via brown water, which was delivered by the Flint water system laden with organic matter on which Legionella and other bacteria feast. State epidemiological reports found more cases “associated” with McLaren than with any other source of exposure, but have not made a connection with Flint River water. Director Nick Lyons, asked why the state health department did not act sooner to alert the public, said this week that experts had linked multiple Legionnaires’ cases to a single hospital and thought the problem might be resolved if the hospital took appropriate actions. Officials have said it’s impossible to identify the strain because Legionella samples were never kept from the patients who had Legionnaires’. According to Stout, the University of Pittsburgh professor, studies have estimated Legionella would be found in about 50 percent of hospitals if water testing were required by the federal Centers for Disease Control and Prevention. Eisner referred questions about how the bacteria got into McLaren’s water system to water experts at the Michigan Department of Environmental Quality. A state epidemiological study released last week noted 16 of 45 people who came down with Legionnaires’ between June 2014 and March 2015 had been patients at McLaren before the onset of symptoms. It concluded that McLaren was more strongly “associated” with the outbreak than any other possible source — including Flint River water. About 47 percent of the cases involved patients whose primary water came from the city. A report released Thursday on 42 cases from May through November 2015 said 22 were hospitalized at what was identified as “Hospital A” within two weeks of Legionnaires’ onset. One was an inpatient at Hospital A and another facility. Eisner would not name the hospitals, saying the facilities were identified by error in the earlier report. Before the water switch, Genesee County reported only about a dozen cases of the disease each year. “In this case, the Legionella outbreak that was reported from June 2014 to March 2015 was found to have an association with a health care facility, and that facility did undertake remediation,” state health department spokeswoman Jennifer Eisner told The Detroit News, identifying McLaren Regional Medical Center as the facility. Genesee County Environmental Health Division Director Jim Henry said the county worked with McLaren — which uses Flint city water — to resolve a “brown water” issue that occurred after the city switched from Detroit water to Flint River water in April 2014. At least one water main rupture occurred near the hospital, he added. Prochazka said the hospital noted an increase in Legionella cases at McLaren and other local hospitals shortly after the city switched to Flint River water. Aggressive water testing indicated the presence of a “low level” of Legionella bacteria, she said. “Once this was identified, we put immediate measures in place that were successful in controlling the situation,” she said. “We have taken additional measures to safeguard the quality of our water system even more by installing a secondary water disinfectant system throughout the entire facility at a cost of nearly $300,000. The University of Pittsburgh’s Stout said an exact molecular match is ideal for determining where the bacteria came from. In the absence of scientific proof, studies have found links between poor quality water from community water systems and increased cases of legionnaires’ disease in New Jersey and Baltimore. “You have to look at what’s probable,” Stout said. “(When) you have these brown water events and you have water main breaks ... the result of that is you have more nutrients in the water. “The other benefit is that the materials neutralize the chlorine in the water so it’s not available for killing this bacteria,” Stout said. Marc Edwards, a Virginia Tech researcher whose water testing helped uncover the lead contamination problem, suggested a link between the increase in Legionnaires’ cases and a critical misstep in the MDEQ’s handling of Flint’s water treatment — the state’s failure to require corrosion controls to prevent lead from leaching into the water. Edwards and his research team won a National Science Foundation grant in September for a study on the effects of interruptions in corrosion control. Stout said it’s fairly uncommon for people to get Legionnaires’ disease from water at their homes. Large, complex water system in big buildings are more likely to harbor the bacteria. Jim Henry, the county environmental health director, said it’s been difficult to get information needed to track the origin of the disease. He has submitted a Michigan Freedom of Information Act request to the city of Flint for the location of water main ruptures that result in brown water and is still waiting for a response.